The website was the keystone of our engagement. The primary objective was to deliver 300 leads to the sales team for phase one cottage sales. They would then ask these potential buyers to put down a $1,000 deposit, sight unseen. That would give them the right to eventually sign a contract to build a cottage. The cottages ranged in price from $275,000 to over $1,000,000. They would need to sell 100 cottages before construction began. Our a secondary objective was to build a pool of potential renters to occupy the rental units and hotel. Since the site was launching 2 years before the resort would be complete, it would need to be flexible, allowing for more substance to be added as resort details and assets were revealed. Along the way, we would also be responsible for stewarding the brand, engaging the existing Margaritaville base while extending to consumers beyond the brand, and fostering a relationship with our audience that would encourage them to come stay at MRO. Margaritaville Resort Orlando is at the intersection of two giant followings: 62,000,000 visit Orlando every year; the Margaritaville Brand engages with 60,000,000 customers. Our job was to excite both bases, letting them know there was a new way to experience the city and the brand, and all each has to offer. We supplemented information provided by tourism boards and the corporate brand with research that identified audiences that were ideal for our objectives. Due to the range of ways to experience a stay at MRO (as a hotel guest spending $200/night to a cottage owner spending over $1,000,000) we had to reach a broad group with tailored messages. With selling homes as our primary goal, we focused on married couples with children, 44 years old and up. And while the brand and city both have national appeal, we focused on the eastern half of the county where both have a higher appeal. We supplemented existing research with our own to identify, then test, potential messaging points. We found that three topics generated the highest engagement: 1. Becoming “immersed” in Margaritaville 2. Learning “the business of” Margaritaville 3. Being “in the know” as it related to Margaritaville activities From a creative standpoint, we knew we needed to elevate the brand. This would be required to compete with the other parks in the vicinity. It would also create excitement that would mobilize the existing Margaritaville customers. We also knew our content needed to be worth consuming, work on any screen and be quickly digestible to capture the attention of our audience. Furthermore, we constantly monitored engagement with content to refine audiences and hone our messages. This was the key to maintaining the site’s 10% conversion rate (lead submissions / unique visitors). 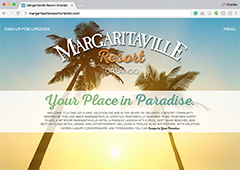 Our message was to "make the Margaritaville lifestyle possible for everyone to enjoy while visiting Orlando by offing a vacation experience that was on their terms and in their very own place in paradise.” This stands out in a market that instructs you to do more and more while prescribing a vacation experience that visitors feel obligated to execute. It takes away the fun of vacation by adding the pressure of itineraries that are detailed down to the minute. The website was crucial to accomplishing all of our goals (300 ownership leads and pool of renters). With only $10,000 of paid media to drive traffic, the website captured over 1,000,000 page views, nearly 350,000 visitors and 450,000 sessions. The blog chipped in an additional 126,000 page views and 110,000 visitors. As of April 2018, they’ve combined to gather over 35,000 total leads. 20,000 are potential hotel and cottage guests 12,000 are interested in owning their own cottage. The sales team converted the leads into 550 deposits then 225 Closed Contracts, selling through all inventory in the first 2 phases of the development without the use of a single outside broker. This leaves 325 additional depositors awaiting new inventory, assuring continued success as more cottages are built in coming phases. On the rental front, we’re excited for the resort to have 20,000 leads in the queue to assure the hotel and cottages are booked solid from day one.